The name of Lotus, absent since 1994, returns to Formula 1 this year, and if that name is all it shares with its legendary forbear still I think it something to celebrate, not least because Jarno Trulli and Heikki Kovalainen, good men both, have survived the shake-ups of the winter past. I saw all of these, and more, win at the wheel of a Lotus, but even now, nearly 30 years after his death, mention of the marque first brings to mind the man who founded it. 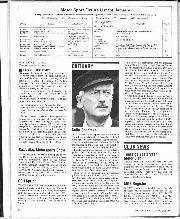 In his leaner moments, Colin Chapman, pencil moustache and all, bore a passing resemblance to David Niven, and when he was in the right mood his manner, too, could remind you of the movie star. 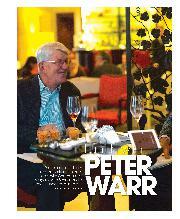 As a raconteur – humour drier than dry – he could mesmerise. Not that he was always like that. Chapman was perhaps the most complex individual I have known in motor racing, capable of childlike rages, dignified stoicism, and all points between. If ever a man believed attack the first form of defence, it was he. I found this out early in my journalistic career. 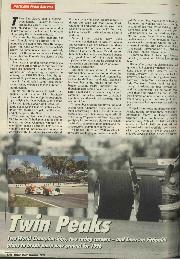 Back in 1971 I had an Elan – in fact, I drove it to Barcelona for the first race I ever covered. Something of an act of faith this, for normally I hesitated to tackle long journeys in the car. Sleeping by the side of a country road, Rotoflex coupling sheared, could do that to you. On this occasion, though, the car ran like a watch, and when an Elan was behaving properly you could forgive it anything – why else would I have replaced the first with another, the second with a third? It was like having a sulky, irresistibly gorgeous girlfriend, the very kind your mother warned you about, thereby guaranteeing you never stopped looking for them. At one stage I became fretful about the oil consumption of the Elan’s twin-cam engine, and – knowing no better – thought to broach the subject with Chapman. “Of course it uses oil!” he responded at once. “What d’you think’s lubricating it? What you need to worry about,” he added, darkly, “is an engine that doesn’t use oil…” I think I finished up apologising to him. As well as being the greatest innovator this sport has known, Chapman was a driver of considerable ability, an English Uhlenhaut. So he was. 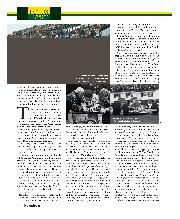 Probably my earliest Lotus memory is of the 1956 British Empire Trophy at Oulton Park, of Chapman fighting with Stirling Moss and Mike Hawthorn. When you speak of Chapman, of course, in the same beat you must speak of Clark. Never, in his eight seasons as a Grand Prix driver, did Jimmy race other than a Lotus. Oddly enough, though, whenever I think of Clark – picture him in my mind – he is not at a Grand Prix, or in Gasoline Alley, or anything of the kind. 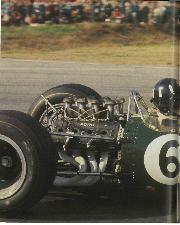 Instead, it is Saturday, April 11 1964, and he is at Oulton Park. At the time I was preparing to go back to school for my final term, but some racing dates fell happily – British fans were extraordinarily well served in those days. 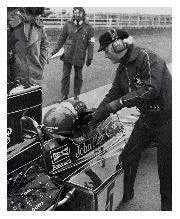 The following weekend I watched Jimmy race his brand-new Lotus 33 in the Aintree 200, but this meeting at Oulton was merely a ‘national’ affair. For all that, there in the paddock was Clark, on this chilly day wearing a button-up cardigan over his pale blue Dunlop overalls. He was smiling and good-humoured, just standing around, stamping his feet to keep warm, chatting and signing autographs. A woman offered him tea from her Thermos, and it was gratefully accepted. And this was the reigning World Champion, one who had run away with the 1963 Grand Prix season and finished second in the Indianapolis 500 at his first attempt. Another world, was it not? Jimmy had been due to give the fearsome Lotus 30 sports car its first race at Oulton, but the car wasn’t ready (a state of affairs which was never materially to change), and so at the last minute it was decided he should race an obsolete 19, entered by privateer George Pitt, who was only too willing to stand aside for the master. And Clark, of course, dominated the Oulton Park Trophy. Earlier Jimmy had won the saloon car race in a works Lotus Cortina, and his hat-trick came with victory in the GT event, at the wheel of Ian Walker’s Elan. Just another day in the life of a World Champion, but one I have never forgotten, not least because it defined for me how a great man can behave. 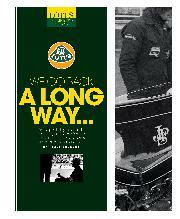 It is no more than inevitable that so many of my Lotus memories should be wedded to Jim Clark. I saw him win the Aintree 200 in 1962 in the revolutionary Lotus 25, and watched him finish third in the same race a year later after taking over the car of Trevor Taylor (the last time, I believe, a car changed hands in an F1 race), making up half a minute on Graham Hill’s winning BRM, and setting a lap record which was to stand for all time. I was there, too, at Silverstone in 1965 when Jimmy won the British Grand Prix, coasting through Woodcote in the late laps, trying to save an engine with disappearing oil pressure. Two years later, now in the Cosworth-powered 49, he won again, this time without problem. A while ago I saw in an auction somewhere a handwritten letter from Clark to Andrew Ferguson, the Lotus team manager, in that summer of ’67. Jimmy had taken to commuting from Paris (where he was spending a year in tax exile) to the European races in his yellow Elan, and the car – surprise! – was not without its foibles, which its owner detailed at some length. Then there was a PS, asking Ferguson if he’d give The Green Man a ring, to see if a room could be found for him over the British Grand Prix weekend. As I said, another world. It was to be the last time Clark raced in Britain – indeed the last day on which he set foot in the land – for his tax exile status allowed only a handful of days here, and ended ironically the very week of his death, at Hockenheim the following spring. That may have been so, but the desire for success remained. That same year Graham Hill won the World Championship in a Lotus, and for 1969 he was joined in the team by Jochen Rindt, a driver with whom Chapman had many a spat, but one whose genius he found irresistible. 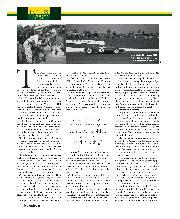 I have written before of the ’69 British Grand Prix, of the race-long scrap between Rindt’s Lotus 49 and Jackie Stewart’s Matra, but another race at Silverstone that year – the Daily Express International Trophy – made as great an impression on me. 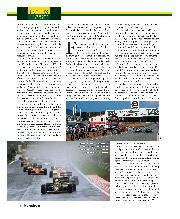 Team Lotus did not so much as arrive for Friday practice, and the following day there was rain. Finally it stopped, and on a still slippery track Rindt went out to try and salvage something: through the old Woodcote he was travelling at a different sort of speed from anyone else, and somehow turned in a lap good for the third row of the grid. On Sunday there was more rain, and this time it didn’t abate. When the race started Rindt – electrics soaked – had a severe misfire and went swiftly towards the back, but after a few laps the DFV chimed in again, and then Jochen went motor racing. Within five laps, in appalling conditions, he had made up five places, after which he passed Stewart, Piers Courage and Jacky Ickx so that only Jack Brabham was ahead, almost half a minute up the road with 20 laps to go. At the finish Brabham was still a couple of seconds ahead, so this wasn’t a Lotus victory, but Rindt’s drive was one for the ages. 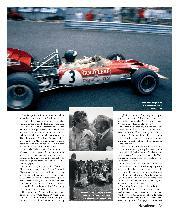 Then – of course – there was Monaco in 1970. Jochen in extremis. Disappointed by the new 72’s early reluctance to shape up, Lotus had reverted to the 49 – now in its fourth season – for Monaco, and Rindt qualified a disinterested eighth. For much of the race, too, he made little impression, running behind Henri Pescarolo’s Matra, but as such as Stewart and Chris Amon fell by the wayside he began to move, and with 20 laps to the flag was in second place, 15 seconds behind… Brabham. Ten laps to go, and Jack still led by 11 seconds, but now Jochen’s pace was surreal, and at the start of the final lap the gap was down to a second and change. I was watching from the grandstand at the old Virage des Gazometres, the final hairpin before the pit straight, and had my camera at the ready. 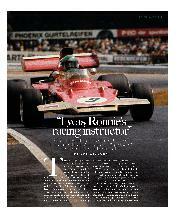 Through the viewfinder I saw Brabham go off line to lap Courage – and then understeer into the barrier at my feet. There was time enough just to snap Rindt at the apex. He was looking left, shaking his head in disbelief. What Jochen had put into those final laps was evident as he stood with Grace and Rainier in the Royal Box, tears flowing. His last lap – 1min 23.2sec – was a second faster then Stewart’s pole, almost three seconds inside his own qualifying time. Much later – after midnight – Jochen left the Gala Ball at the Hotel de Paris and came down with his wife Nina to the Tip-Top Bar, the pair of them swinging the trophy between them. It was simple joy, and he wanted the fans to share the moment with him. Someone handed him a beer, which he swigged from the bottle. I felt I was at the centre of the world. Four months later Rindt was killed in qualifying at Monza when ‘something broke’ on the Lotus 72 with which he had by then won at Zandvoort, Clermont-Ferrand, Brands Hatch and Hockenheim. Although he never knew it, Jochen was the World Champion of 1970. Nor, even more, was Fittipaldi expecting what happened next: remarkably, he won the US GP with the team’s latest recruit, Reine Wisell, third. As when Hill won at Jarama, soon after the death of Clark, this new success for Team Lotus could not have come at a more crucial moment. Two years later Fittipaldi won the World Championship in the now fully developed 72, which he considers the best car he ever drove. Another title could have followed in ’73, but by now Emerson had been joined in the team by Ronnie Peterson, and the two took points from each other, allowing Stewart to win his third title in a Tyrrell by no means the equal of the Lotus. The mid-70s were fallow years for the team, but matters began to improve when Chapman was at last able to persuade Mario Andretti to commit to a full-time F1 programme – it had been in his mind ever since 1968 when Mario, on his GP debut, put his 49 on pole at Watkins Glen. If Clark were irreplaceable in Chapman’s mind, Andretti he considered the closest to Jimmy in terms of what he could do for Lotus. Andretti was never under any illusions about Chapman. Like anyone who ever worked for him, he was well aware that his employment would end the day Colin spied someone he believed could do the job better. But still, like all the others, Mario wanted to be there, for he knew that when Chapman was on song, being part of Lotus – ahead of the game – was uniquely satisfying. In 1977, at the wheel of the 78 ‘wing car’, Mario won more Grands Prix than anyone else, but still lost the title to Niki Lauda and Ferrari. Chapman, who well knew the extent of Andretti’s contribution to the Lotus revival, decreed that 1978 should be ‘Mario’s year’. It was. By now Lotus – alone – had moved into the ‘ground-effect’ era, and the 79 was not only the most beautiful British F1 car of all time, it also went round corners like nothing else. Andretti won six Grands Prix, and duly became champion. It was Mario’s tragedy that the day he achieved his life’s ambition, at Monza, he also lost his closest friend in the sport. Ronnie Peterson, who had rejoined Lotus for ’78, was involved in a multiple accident at the start. I was doing a book with Andretti that year, in anticipation of his winning the title, and that Sunday evening at Monza is as poignant a memory as I have of motor racing. In the team’s caravan there was Mario, unable to celebrate in the moment of his greatest triumph – until, at mid-evening, a call came through from Professor Sid Watkins at the Niguarda Hospital in Milan: Ronnie’s legs were badly broken, but his vital signs were good, and all should be well. Andretti came off the phone elated, and at once opened the Moët. We drank a toast to Ronnie, and then to Mario’s championship. The next morning he went to visit his buddy, only to be met on the hospital steps by Fittipaldi: Peterson had died during the night from injuries that should never have been fatal. “Unhappily,” said Mario, profoundly shocked, “motor racing is also this…” No one ever put it better. Four years later Chapman, too, was gone, victim of a massive heart attack at the age of 54. It had been his invariable custom, when one of his cars won a race, to jump on to the track and hurl his cap in the air: he did it for the last time in August 1982, when Elio de Angelis beat Keke Rosberg by about a foot at the Osterreichring. After 1978 Lotus successes were few, but there was something of a renaissance in ’85 when Ayrton Senna was prised out of his Toleman deal and installed as de Angelis’s team-mate. It’s a fact that, in his later years, Chapman – perhaps preoccupied by darkening shadows elsewhere in his life – played a less direct role in the running of Team Lotus. Had he somehow managed to sidestep the fallout from the de Lorean affair, however, Colin’s interest would surely have been reinvigorated by the mercurial ways of Senna. Given their personalities, they would have fought like hell – but imagine what they might have achieved together. Although all but six of Ayrton’s 41 GP victories were scored in a McLaren, my abiding memory is of his first win, in a Lotus, at Estoril in 1985. In an era for the gods – turbocharged engines, giving 1400 horsepower in qualifying, over 1000 in the race – it was a drive for the gods. Ayrton had taken the lead at the start, and simply driven away. For a man in only his 17th Grand Prix, and in conditions unthinkable for racing today, it was a numbing performance, and the pity was that – thanks to the miserable weather and exorbitant ticket prices – so few were on hand to witness it. Hence, he and Senna had never spoken before, but Ayrton was a man who knew his history, who had long read about motor racing, and appreciated the extent of Jenks’s wisdom and experience. By the time the aeroplane touched down at Heathrow, DSJ had a new hero. As I watched him that day in Portugal, listened to his engine at the first turn, I was sure Senna was using at least one gear higher than usual, and asked him about it. “Of course I was!” he retorted. “Less wheelspin… easier to drive. Wasn’t everyone doing that?” Well, no, actually. Colin Chapman would have loved it.